I invite you to come and experience a work-in-progress of “Present Woods”. It is currently 20 min long and it can be experienced by 15 persons simultaneously. As such it will run approximately 6 times between 16:00 and 18:00 on Sunday November 1st. This means that you are more than welcome to arrive at any point in time to MDT but you might have to wait for a bit. At 18:00 he’ll arrange a short talk for anyone who wishes to stay. This format and way of working is new to me. This is the my first piece that I create on my own and therefore I really do need you to come and experience Present Woods. I’m in need of observations, opinions, ideas and more from someone else but me. So please stay until the talk at 18:00. The work of Murray Schafer and others in the 60’s lead to the founding of the discipline acoustic ecology. Within it they study mankind and its relationship to its surroundings, mediated through sound. Robin Jonsson is inspired by acoustic ecology with its focus on the dynamic relationship inherent in soundscapes around us. He wants to encourage others to listen more carefully to the worlds around them as it will raise an awareness of how we relate to, co-create and are affected by the soundscapes around us, natural and artificial ones. “Present woods” will make you see with your ears as it transforms you and the room to another place and time. 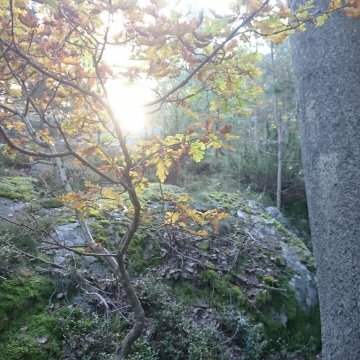 “Present Woods” has been awarded support from Kulturbryggan and Konstnärsnämnden. Köttinspektionen in Uppsala and MDT in Stockholm has supported the project.